Lewis Hamilton (1st, 1:42.553): "I'm really happy and grateful. The past few weeks have been great and I've carried the positive energy from my holiday into this weekend. Until I crossed the line and got the pole I hadn't really realised that I had matched Michael's record. It's crazy to think that in 1996, when I was eleven years old, I came here to watch Michael - and now I've equalled his record. I'm honoured to be up there with him now and starting the second half of the season this strong is an amazing feeling. I have not really had any bad laps this weekend. But it's going to be tight tomorrow. Ferrari's race pace looked good yesterday, so I think it will be a lot closer tomorrow. The rundown to Turn 1 is short, but pole is still the best position to start from. I will try to make it work tomorrow." Valtteri Bottas (3rd, 1:43.094): "First of all, congratulations to Lewis for his 68 poles, that's a mega achievement. Unfortunately, I didn't have the pace to fight for the pole today. I'm not sure about the reasons; I'm slightly confused as to why I haven't been able to get closer. We will need to look for a few more answers in the data. The balance in the car felt good, but I was lacking grip, so I was particularly struggling in the high-speed corners of sector two. I felt a lot more comfortable in the car with high fuel, so that's good for tomorrow. Driving the 2017 car around Spa is mega - it's so quick, I've never experienced anything like it. We are both starting in the top three, so as a team we will still try to achieve our target and that is a 1-2." Andrew Shovlin: "We knew it would be a tough session with Ferrari very close to us in terms of ultimate performance. So it was a question of extracting every last bit of performance from the car in order to take pole position and we managed to do that. Congratulations first of all to Lewis, it's an incredible achievement to equal Michael's record. Lewis has been happy with the car all weekend, feeling very comfortable and progressively building up to that amazing lap in Q3. It hasn't been so straightforward for Valtteri, who was some way off in the cooler practice conditions this morning. But we made some changes to the car and he was finding time in himself throughout qualifying; even so, there is still a gap between the two cars, so we will go through the data to understand where that time is. Ferrari showed very impressive pace on the ultra-soft tyre during Friday's long runs and we are expecting a close race. We have chosen a lighter wing level than them, which will help us both attacking and defending in the first and third sectors, but it will be a close battle - as we can expect for the rest of the year - and we will be fighting as hard as we can." Toto Wolff: "That was a mighty lap from Lewis and one worthy of equalling Michael's pole position record. Lewis has been on top form all weekend and it was a very special moment for him to take pole position number 68. It puts him in the strongest position for tomorrow's race - but it's only the first step. On Valtteri's side, it has been a trickier weekend for him. We made some changes to the car after FP3 and he made a step forward with every run in qualifying, finding more and more time. It was looking very close for the front row, then Sebastian got the tow from Kimi in the final sector that gave him the advantage. But overall, a good pair of starting positions and a good weekend so far, with our new specification engine performing well. But the hardest bit is still to come." Max Verstappen (5th, 1:43.380): "I was really happy with my lap in Q3, it couldn't have been better to be honest as I feel I put everything together and got the best performance out of the car possible. I think the lap felt better than P5, last year I was P2 and I think it felt just as good this year, but I'm happy with the result anyway and would say it was a perfect qualifying. I am positively surprised we are so close to Ferrari, Lewis was way ahead but in the race I think we can be closer so perhaps a good result is possible. Our strength is in sector 2 so we will work even harder there to improve a bit but in general the balance of the car was great and that allowed me to execute a very good Qualifying session. Although the car felt good today I still think we need a bit of luck to do something special tomorrow. For now it looks like it will be a dry race so let's hope that changes overnight and I think then we can fight properly. On my fast laps I was concentrating too much but on my in lap I could see the orange crowd and smoke from all the fans, this is amazing to see. As I left the pit lane there was a guy on the fence in all orange waving me on, it's awesome." Daniel Ricciardo (6th, 1:43.863): "We were a bit off in Q1 but I knew there was more time and then in Q2 we got closer to the pace that we needed. Unfortunately in Q3, when you really start to get everything out of it, we couldn't get much more. I felt like if I pushed more in one part of the track it killed me in another part so I didn't really feel we had the car to complete one lap at 100%. I just felt a little bit limited with the balance. But I'm going to be optimistic and say, if that's the case maybe that means we have got a more consistent car for the race. If we're not getting the peak out of the tyre maybe we can sustain a relatively good pace for longer than the others, so that's what I'm betting on." Christian Horner, Sporting Director: "I think fifth and sixth were unfortunately the predictable outcome of today's Qualifying but both drivers delivered the maximum they could. Max in particular had a very strong last run, and in locking out the third row of the grid hopefully we can capitalise on any opportunities tomorrow. It should be an interesting race and there can always be a weather element here in Spa, you never know. With a huge amount of 'home' support and an enormous crowd that has turned out to support Max this weekend that's hopefully worth a few tenths too." Sergio Perez (8th, 1:44.894): "I am a bit disappointed with my lap in Q3. I was close to Raikkonen in sector one, but when he aborted his lap in sector two I ended up being too close to him. As a result, I lost of a lot of aerodynamic load and that cost me a couple of tenths. I believe we had the pace to be ahead of the Renault today, but I still think we are in a good position for tomorrow. Spa is a place where anything can happen so it will be important to stay out of trouble and take the opportunities that come our way. The first lap can be really messy: not just in turn one but also at Les Combes, when the pack bunches up again. I think we can be strong tomorrow and I really hope we can get the result that the team deserves." Esteban Ocon (9th, 1:45.006): "I think a better result was possible today. From Q2 onwards I started to lose some grip and we need to analyse and understand what happened. I was three tenths faster on my Q2 lap compared to Q3 so we didn't maximise things and I'm not totally satisfied. However, I feel confident about the race. The car is working well and we have a quick race car, especially in the first and final sectors. That will help us tomorrow. It's a track that encourages good racing and I think there will be opportunities tomorrow and some close battles." Otmar Szafnauer, Chief Operating Officer: "We achieved the objective of getting both cars inside the top ten, which sets us up nicely for a strong race tomorrow. I don't think our final laps in Q3 were optimal and there was a bit more potential in the car, but the important thing is that we are well placed to score good points. We've focussed on setting the car up to race well and hopefully that will pay dividends tomorrow. The forecast suggests we will have similar weather tomorrow with a low risk of rain so if we can make a clean start we have every chance to convert our speed into a solid result for both cars." Felipe Massa (16th, 1:45.823): "I'm so disappointed with the result. We're not competitive enough. I thought maybe the crash would have been a problem today but I managed to understand the balance and the car. The car is just not competitive so I'm pretty disappointed. Even before losing five positions on the grid, it's not a great start for the race tomorrow but racing is racing. We need to try everything we can and that's what I'm looking forward to tomorrow." Lance Stroll (18th, 1:46.915): "I had a broken rear endplate and it is just one of those things that happens. Unluckily that held me up so I couldn't get out for a second run in Q1 and my qualifying ended there. We need a quicker and more competitive car, as we just can't carry the speed that some other cars can and it is really costing us a lot on certain tracks. If I had got out there for my second run I would definitely have gone quicker, but I think it would have been tough to get out of Q1. It is very frustrating and not where we want to be, but we have got to keep working on the car. I just hope for a better day tomorrow, as we have long straights, overtaking is possible and you have got to be positive and hopeful." Paddy Lowe, Chief Technical Officer: "A disappointing result. Felipe obviously went into qualifying knowing that he would have a 5-place penalty. He was knocked out in Q1 in P16 and unfortunately on Lance's car, we had a failure on a part of the rear-wing which the mechanics tried to change in the very limited time available but we missed the cut." Fernando Alonso (11th, 1:45.090): "In the end, today was a positive day for us, if you look at the overall performance. We were 1.5 seconds from P1 in Q2, and this for us is like pole position. However, at the end of the lap, because of an issue we didn't manage to make it into Q3, but it could have been possible today. The team did a great job and we tried to take benefit from Stoffel's penalty to help the other car take some slipstream on the straights. But, at the wrong time ‘ in the last attempt in Q2 ‘ we had a problem with the deployment, and I lost six tenths between Turns 11 and 12, so I aborted the lap because it was no longer possible to improve. 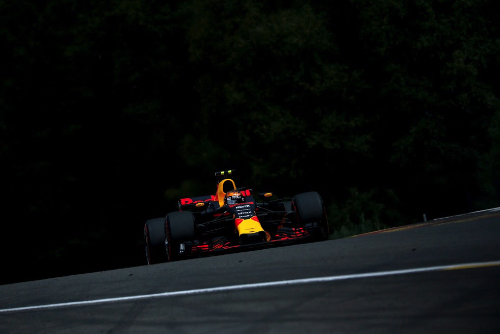 We'll start from P11 tomorrow ‘ which here in Spa is a bit of a surprise for us anyway ‘ and maybe being on new tyres and choosing the compound is better than starting 10th." Stoffel Vandoorne (15th, 1:45.441): "It's been reasonably positive today ‘ I've been preparing for the race all weekend because I know I'll be starting from the back. Today was all about helping Fernando try to get both cars into Q2 and then help him with the slipstream, and that's what we did. Unfortunately he just missed out on Q3, but now we have to focus on tomorrow. I know starting from 20th I've got a lot of catching up to do. I hope I can rely on the usual Spa weather like I could yesterday in the practice sessions ‘ that would definitely help us! We knew it was always going to be difficult to get into Q3 here. We tried everything we could today, I tried to help the team as much as possible, and it's a shame that Fernando just missed out. It was good teamwork today. Fernando and I have a very good relationship ‘ we've showed that in the past, and we've showed again today that we work really well together. I'm sure the situation will come where I'll need his help! This weekend is so special for me ‘ there are a lot of fans here, and I have friends and family here with me to cheer me on. It definitely gives me a little extra bit of motivation for my home grand prix." Eric Boullier, Racing Director: "Today the team showed immense strength and spirit after a difficult start to the day. I'm both pleased and proud of the efforts of every single one of the guys and girls in the garage, who worked together seamlessly, executing the perfect strategy in order to optimise our potential for tomorrow's race. Overnight, we discovered some issues within Stoffel's power unit, which led to another PU change and further grid penalties for our Belgian star at his home race. His crew worked tirelessly to ready his car in time for FP3, and I'd like to praise and thank them for all their hard work. Also, thanks to both Stoffel and Fernando, who acquitted themselves admirably as the perfect team-mates throughout qualifying. In Q1, Fernando and Stoffel helped each other with tows ‘ even on the same lap ‘ a remarkable feat to pull off, and one which helped them both to progress to Q2. In Q2, Stoffel ‘ fully aware of his starting position for tomorrow's race ‘ did the honourable job of sacrificing his own performance to provide Fernando with an extra little boost on what is renowned for being an extremely challenging, power-hungry circuit. Bravo, Stoff ‘ I'm sure the favour will be returned in due course! After a tough start to the day, and despite a lot of effort, a broken curfew, and excellent teamwork, it's a shame that Fernando was unable to progress through to Q3. He came excruciatingly close, until a deployment setting issue at the end of his final flying lap meant he was unable to better his lap time. However, 11th place isn't a bad place to be, and it gives us more options for tomorrow's strategy. History tells us that this will be a tough race, but with hard work, luck, and potentially some changeable weather on our side, I hope we can put on a good show tomorrow for our Belgian fans." Yusuke Hasegawa, Honda: "I feel satisfied that Fernando will start the race from a position ready to fight for points at this power-hungry Spa-Francorchamps track. As is always the case with Fernando, he pushed to the maximum during the session, and although he missed out on Q3 he finished 'best of the rest' which leaves the team a free choice of tyres for the race tomorrow. We think we could have extracted a bit more from our package, but the power deployment ran out before the end of Fernando's final flying lap. We will now work on adjusting the settings accordingly with McLaren and Fernando before the race. Regarding Stoffel, we detected a potential issue in his ICE data after yesterday's FP2 and as a precaution opted to change his power unit overnight. With this in mind, his qualifying strategy was to concentrate on set-up for the race, rather than pushing for position. We also witnessed some incredible teamwork between our two drivers today. Both Stoffel and Fernando worked seamlessly to help each other with tows, which helped them to progress through into Q2. Considering today's performance, we're hopeful that we'll be able to score some much-needed points tomorrow, and we'll do our best to maximise the opportunity." Carlos Sainz (14th, 1:45.374): "I'm a bit disappointed with ending up P14 in today's qualifying because we've had a good weekend up until now; I've been on it since FP1, always in the top ten and doing very good laps. Today's qualifying was more of the same ... we were starting to think a top ten qualifying was possible here, but when you see yourself only P14, it's quite frustrating. I think I extracted the maximum out of the car so we just need to keep pushing. We will see what we're capable of doing tomorrow ‘ it's been a good weekend so far, so there's no reason to think we can't go forward! ‘ and hopefully we can fish some points!" Daniil Kvyat (17th, 1:46.028): "I haven't driven much this weekend, so it's not been easy ‘ in this morning's FP3 we had an issue with the PU and I have to say the guys did a great job to get the engine changed in time for Quali! I tried to do the best lap I could but I wasn't feeling totally comfortable and we were only able to end up P17... I haven't even done a single long-run, so it's difficult to say what to expect for tomorrow. We also have a grid penalty so we will be starting from the back, but we will try our best and see where we end up." James Key, Technical Director: "Today hasn't been the day we were looking for, we were more comfortable with our progress on Friday and generally ok this morning in FP3, at least with Carlos. We found the issues that stopped Daniil from running yesterday and had them corrected overnight only to have an engine failure just a few laps into the FP3 session. So, sadly for him, he's had no real reference points at all this weekend, no long-runs on the softer tryes or shorter runs on the Ultra Soft tyre prior to qualifying, so his weekend has been thoroughly compromised and the team apologizes to him for that. Of course, we'll try and do our best for him tomorrow from where we start after the penalty for the 5th PU. I'd like to thank all the mechanics, who so quickly changed Daniil's engine between the end of FP3 and the start of qualifying, enabling us to get the car out and cover two runs in Q1. It was an absolutely fantastic job and, as always, we know we can rely on them to turn it around when we have an emergency. For Carlos, we had a similar balance on the car to yesterday. Generally, it seemed to be okay in FP3 so we went through the programme as planned and got the information we needed from the session. In Quali, we looked okay in Q1 and we were in the top ten at that point, but we didn't make any progress beyond that point, Q1 was our quickest lap of the session and we couldn't seem to find an extra bit of performance for Q2. We will have to look at where we missed something there, but it means that we didn't progress to Q3 as hoped ‘ we needed a few more tenths to do that today. We will now have a look into this and concentrate on what we do tomorrow from grid positions that are a little bit lower than expected and take it from there." Romain Grosjean (12th, 1:45.133): "Yesterday we tried a few downforce levels and, clearly, we had one that was far too light and it made the car tricky to drive. Today I'm very happy with myself and the team. It was a hell of a lap in qualifying. I could've done better with the tow, but I wasn't quite close enough to the car in front of me to get the advantage on the straight line. The rest of the lap was pretty amazing. It's the best we could do, to be fair. The car felt OK setup-wise. I pushed really hard, but on the low-drag circuits we've been struggling a little bit. It's going to be a long race tomorrow with a lot happening. Nobody has real information about tire degradation and from the few laps I did yesterday on high fuel, the car felt OK. I'm looking forward to it." Kevin Magnussen (13th, 1:45.400): "Qualifying was OK. The last run I didn't put the lap together, which was a bit of a shame. I don't think it would've changed so much anyway, but it's never so good when you don't get your lap together. In the end, I think the gap was too big to do anything. Only Romain was within reach, really. It's not a bad position for tomorrow's race to try and fight for points. Not a lot has to happen at the front to get us into the points. We don't really know how the car is in race trim, but we'll see tomorrow. I don't expect it to be too different from today. We should be able to fight for points." Guenther Steiner, Team Principal: "Yesterday we would've taken this result, but you always want more. This morning it looked good, and from yesterday we turned it around. Everybody did a great job. We ended up 12th and 13th and we were very close to 11th. Tomorrow, from these positions, we have free tire choice, so we'll see what we can do." Nico Hulkenberg (7th, 1:44.982): "I'm very pleased with qualifying as I haven't been able to get the set-up exactly where I wanted it, yet I could still get a P7 time when it mattered. We were still working on set-up today as I haven't been able to find that sweet spot where everything's working at its best. I still don't think we found the best solution, yet I was very positively surprised that we could squeeze a P7 out of it. It's a good effort from the team; tomorrow's going to be a full race. It'll be head down and pedal hard." Jolyon Palmer (10th, No Time): "I've been in a really good place with the RS17 all weekend, easily the best all year. I've had strong confidence in the car, it's felt really well balanced and we haven't had to make many changes, so this bodes well for the future. We had a gearbox problem in Q3, which came after a couple of issues with a clutch sensor, so despite all that it's a positive that we made it into the top ten for qualifying. Without the Q3 issue, P7 was definitely on the cards with the pace we'd shown. I'm hoping for points tomorrow." Alan Permane, Sporting Director: "Overall the car is performing well. The team's overall performance was very good, for the third race weekend in a row we have had the fourth quickest car and this bodes well for the remainder of the season. Jolyon was happy with his car from the first laps of the weekend and although Nico has struggled a little more with an inconsistent balance, he got the most out of it in qualifying. Nico struggled a little bit more than Jo with his car balance. He wasn't as comfortable, sometimes needing adjustments with a little too much understeer and sometimes lacking rear end. At the end of the day he was able to extract the most and get in a good place for tomorrow's race. We are still investigating what went wrong with the gearbox. It's a real shame for Jolyon, without this incident he could have started from a very comfortable P7. He's had a very good, very straightforward and competitive weekend and it's truly unfortunate he wasn't able to make the most of his potential today, through no fault of his own. After yesterday's rain and the threat of a repeat today, the forecast looks good. However, as ever in Spa-Francorchamps, we'll keep a close eye on the radar." Marcus Ericsson (19th, 1:47.214): "We knew that today's qualifying would be a bit more difficult for us, as it is a power sensitive track. Considering the technical issue I had during FP3, and the small amount of laps I was able to complete, the team did a good job to optimise the car. The car felt good, however, we have to find a way to improve our performance. The weather can play a crucial part in the outcome of the race tomorrow." Pascal Wehrlein (20th, 1:47.679): "Overall, today was a better day for me in terms of track time. I ran a good amount of laps during FP3. Unfortunately, our performance is not where we would like it to be yet. We are looking at our data and working on finding a way to improve for tomorrow's race."